Three years have passed since Major Sir Robert Kurland and Lucy Harrington, the rector’s daughter, became husband and wife. Having established a measure of contentment among the gentry of Kurland St. Mary, the couple lately have found an unsettling distance grown between them. But when the small-village peace is disrupted by the arrival of an anonymous letter accusing Lucy of witchcraft, her as yet unfulfilled desire to be a mother becomes the least of her worries, especially after she learns she is not the only one to have received such a malicious letter. Speculation in the village only escalates when the local schoolteacher, Miss Broomfield, is discovered murdered at her classroom desk. Was the unlikeable teacher the letter writer, and if so, who killed her and why? Despite her husband’s objections, Lucy offers to help out at the school until a replacement can be found, hoping the schoolchildren might inadvertently reveal a clue, but by doing so she may be putting her own life at risk . 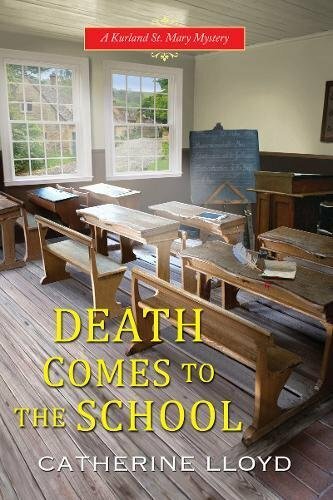 . .
Lucy offers to teach in the school until a replacement can be found, hoping the schoolchildren might inadvertently reveal a clue, but by doing so she may be putting her own life at risk . . .